I am now confirmed in the opinion that we have every year the same number of pairs invariably; at least, the result of my inquiry has been exactly the same for a long time past. The number that I constantly find are eight pairs, about half of which reside in the church, and the rest in some of the lowest and meanest thatched cottages. Now, as these eight pairs - allowance being made for accidents - breed yearly eight pairs more, what becomes annually of this increase? Lawton and May visited the village in 1983, and found major changes in the 200 years since White described it. It is unlikely that swifts had nested in the church tower for 50 years, and the thatched cottages had disappeared or had been covered with wire. Yet, the number of breeding pairs of swifts regularly to be found in the village was found to be 12. In view of the many changes that have taken place in the intervening centuries, this number is remarkably close to the eight pairs so consistently found by White. Another example of a population showing relatively little change in adult numbers from year to year is seen in an 8-year study in Poland of the small, annual sand-dune plant Androsace septentrionalis (Figure 14.1a). Each year there was great flux within the population: between 150 and 1000 new seedlings per square meter appeared, but subsequent mortality reduced the population by between 30 and 70%. However, the population appears to be kept within bounds. At least 50 plants always survived to fruit and produce seeds for the next season. The long-term study of nesting herons in the British Isles reported previously in Figure 10.23c reveals a picture of a bird population that has remained remarkably constant over long periods, but here, because repeated estimates were made, it is apparent that there were seasons of severe weather when the population declined precipitously before it subsequently recovered. By contrast, the mice in Figure 14.1b have extended periods of relatively low abundance interrupted by sporadic and dramatic irruptions. arguments, it will be easier to appreciate the details of the modern consensus (see also Turchin, 2003). First, however, it is important to understand clearly the difference between questions about the ways in which abundance is determined and questions about the way in which abundance is regulated. Regulation is the tendency of a population to decrease in size when it is above a particular level, but to increase in size when below that level. In other words, regulation of a population can, by definition, occur only as a result of one or more density-dependent processes that act on rates of birth and/or death and/or movement. Various potentially density-dependent processes have been discussed in earlier chapters on competition, movement, predation and parasitism. We must look at regulation, therefore, to understand how it is that a population tends to remain within defined upper and lower limits. On the other hand, the precise abundance of individuals will be determined by the combined effects of all the processes that affect a population, whether they are dependent or independent of density. Figure 14.2 shows this diagrammatically and very simply. 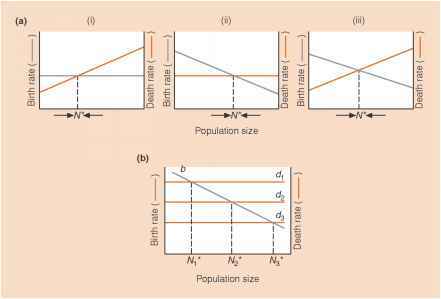 Figure 14.2 (a) Population regulation with: (i) density-independent birth and density-dependent death; (ii) density-dependent birth and density-independent death; and (iii) density-dependent birth and death. Population size increases when the birth rate exceeds the death rate and decreases when the death rate exceeds the birth rate. N* is therefore a stable equilibrium population size. The actual value of the equilibrium population size is seen to depend on both the magnitude of the density-independent rate and the magnitude and slope of any density-dependent process. (b) Population regulation with density-dependent birth, b, and density-independent death, d. Death rates are determined by physical conditions which differ in three sites (death rates d1, d2 and d3). Equilibrium population size varies as a result (N*, N*, N*). Here, the birth rate is density dependent, whilst the death rate is density independent but depends on physical conditions that differ in three locations. There are three equilibrium populations (N1, N2, N3), which correspond to the three death rates, which in turn correspond to the physical conditions in the three environments. Variations in density-independent mortality like this were primarily responsible, for example, for differences in the abundance of the annual grass Vulpia fasciculata on different parts of a sand-dune environment in North Wales, UK. Reproduction was density dependent and regulatory, but varied little from site to site. However, physical conditions had strong density-independent effects on mortality (Watkinson & Harper, 1978). We must look at the determination of abundance, therefore, to understand how it is that a particular population exhibits a particular abundance at a particular time, and not some other abundance. The 'stability' viewpoint usually traces its roots back to A. J. Nicholson, a theoretical and laboratory animal ecologist working in Australia (e.g. Nicholson, 1954), believing that density-dependent, biotic interactions play the main role in determining population size, holding populations in a state of balance in their environments. Nicholson recognized, of course, that 'factors which are uninfluenced by density may produce profound effects upon density' (see Figure 14.2), but he considered that density dependence 'is merely relaxed from time to time and subsequently resumed, and it remains the influence which adjusts population densities in relation to environmental favourability'. The other point of view can be traced back to two other Australian ecologists, Andrewartha and Birch (1954), whose research was concerned mainly with the control of insect pests in the wild. It is likely, therefore, that their views were conditioned by the need to predict abundance and, especially, the timing and intensity of pest outbreaks. They believed that the most important factor limiting the numbers of organisms in natural populations was the shortage of time when the rate of increase in the population was positive. In other words, populations could be viewed as passing through a repeated sequence of setbacks and recovery - a view that can certainly be applied to many insect pests that are sensitive to unfavorable environmental conditions but are able to bounce back rapidly. They also rejected any subdivision of the environment into Nicholson's density-dependent and density-independent 'factors', preferring instead to see populations as sitting at the center of an ecological web, where the essence was that various factors and processes interacted in their effects on the population. Andrewartha and Birch no need for disagreement between the competing schools of thought unrestrained declines to extinction are rare. Furthermore, any suggestion that density-dependent processes are rare or generally of only minor importance would be wrong. A very large number of studies have been made of various kinds of animals, especially of insects. Density dependence has by no means always been detected but is commonly seen when studies are continued for many generations. For instance, density dependence was detected in 80% or more of studies of insects that lasted more than 10 years (Hassell et al., 1989; Woiwod & Hanski, 1992). On the other hand, in the kind of study that Andrewartha and Birch focused on, weather was typically the major determinant of abundance and other factors were of relatively minor importance. For instance, in one famous, classic study of a pest, the apple thrips (Thrips imaginis), weather accounted for 78% of the variation in thrips numbers (Davidson & Andrewartha, 1948). To predict thrips abundance, information on the weather is of paramount importance. Hence, it is clearly not necessarily the case that whatever regulates the size of a population also determines its size for most of the time. And it would also be wrong to give regulation or density dependence some kind of preeminence. It may be occurring only infrequently or intermittently. And even when regulation is occurring, it may be drawing abundance toward a level that is itself changing in response to changing levels of resources. It is likely that no natural population is ever truly at equilibrium. 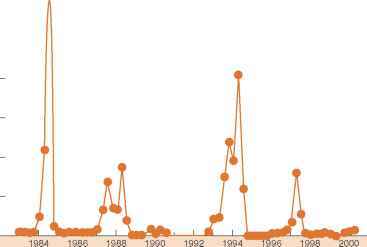 Rather, it seems reasonable to expect to find some populations in nature that are almost always recovering from the last disaster (Figure 14.3a), others that are usually limited by an abundant resource (Figure 14.3b) or by a scarce resource (Figure 14.3c), and others that are usually in decline after sudden episodes of colonization (Figure 14.3d). There is a very strong bias towards insects in the data sets available for the analysis of the regulation and determination of population size, and amongst these there is a preponderance of studies of pest species. The limited information from other groups suggests that terrestrial vertebrates may have significantly less variable populations than those of arthropods, and that populations of birds are more constant than those of mammals. Large terrestrial mammals seem to be regulated most often by their food supply, whereas in small mammals the single biggest cause of regulation seems to be the density-dependent exclusion of juveniles from breeding (Sinclair, 1989). For birds, food shortage and competition for territories and/or nest sites seem to be most important. Such generalizations, however, may be as much a reflection of biases in the species selected for study and of the neglect of their predators and parasites, as they are of any underlying pattern. 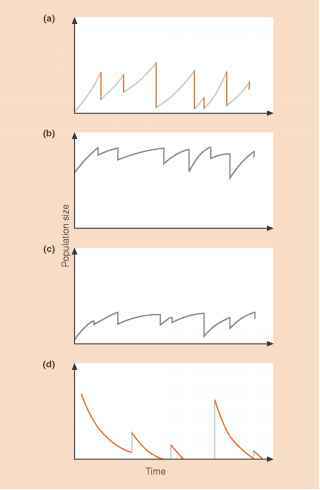 Figure 14.3 Idealized diagrams of population dynamics: (a) dynamics dominated by phases of population growth after disaster; ( b) dynamics dominated by limitations on environmental carrying capacity - carrying capacity high; (c) same as (b) but carrying capacity low; and (d) dynamics within a habitable site dominated by population decay after more or less sudden episodes of colonization recruitment. abundance. They did so having placed population growth rate at the center of the stage, since this summarizes the combined effects on abundance of birth, death and movement. The demographic approach (Section 14.3) seeks to partition variations in the overall population growth rate amongst the phases of survival, birth and movement occurring at different stages in the life cycle. The aim is to identify the most important phases. However, as we shall see, this begs the question 'Most important for what?' The mechanistic approach (Section 14.4) seeks to relate variations in growth rate directly to variations in specified factors - food, temperature, and so on - that might influence it. The approach itself can range from establishing correlations to carrying out field experiments. Finally, the density approach (Section 14.5) seeks to relate variations in growth rate to variations in density. This is a convenient framework for us to use in examining some of the wide variety of studies that have been carried out. However, as Sibly and Hone's (2002) survey makes clear, many studies are hybrids of two, or even all three, of the approaches. Lack of space will prevent us from looking at all of the different variants. 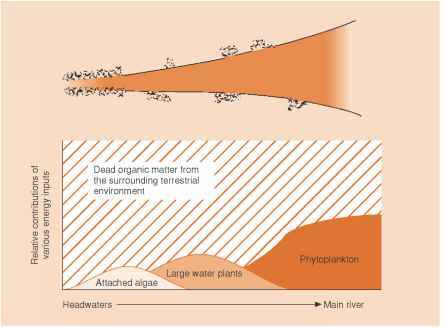 What is fluctuation in ecology?